The U.N. Committee on the Elimination of All Forms of Discrimination Against Women (CEDAW) concluded its 58th regular session on July 18th. The Committee will soon meet for its 59th session so I wanted to get this summary of its 58th session out before the next session was upon us. This is a summary of key developments of the 58th session (June 30 – July 18, 2014). 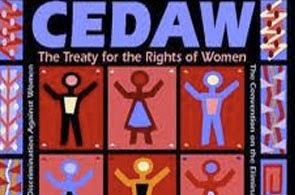 CEDAW monitors compliance under the International Convention on the Elimination of All Forms of Discrimination Against Women. Historically it has met two times a year, but recently that has increased to three times per year in order to catch up on the Committee’s backlog. The Committee has 23 members, half of whom are elected/re-elected every even numbered year. The three session per year format will probably continue and may become permanent. The last election was held this year on June 26th, at which 12 were elected or re-elected. The Convention has been in effect since 1981 (33 years). It has now been ratified by 188 countries, which makes it the 2nd most ratified in the human rights treaty system. The individual complaint mechanism that is available under the Optional Protocol to the Convention has been ratified by 104 countries. The most recent ratification was the State of Palestine which ratified effective April 2, 2014. The Governments of Iraq (on February 18) and Tunisia (April 17) have also notified the UN treaty authorities that they are withdrawing certain of their prior reservations to the Convention. The Committee met shortly after the General Assembly had concluded its treaty body strengthening activity, culminating in a resolution in April, aiming to increase resources and streamline processes in the treaty body system. The announced objectives of the new initiatives were also to reduce backlogs, and improve state reporting and responsiveness to treaty obligations and treaty body requests. These developments were discussed in private session by the Committee at this session and will no doubt have an impact on its proceedings in the future. Other political events happening during or shortly before this session included the kidnapping of over 200 girls by Boko Horam in Nigeria; violence and civil conflict in the Ukraine, Syria, Gaza, the Central African Republic and India, a series of horrific rapes in India, the apostasy case of a Christian woman in Sudan threatened with the death penalty, and the Girl Summit 2014, inspired in part by the experience of Malala Yousafzai and her fight for the right to education of all girls. The Girl Summit was held in London in July, at the same time that this 58th session of CEDAW was meeting in Geneva. It is notable that three of the countries that were reviewed at this session of CEDAW are among these countries currently in the news, the Central African Republic, India and Syria. In addition, a 4th conflict zone, Gaza, was the subject of a special statement of concern and criticism that was adopted by the Committee and released during the session. Another notable event leading up to this session was the publication in March 2014 of a new book by former U.S. President Jimmy Carter, “A Call to Action: Women, Religion, Violence and Power”, in which he calls discrimination and violence against women and girls the most serious, pervasive, and ignored violation of basic human rights in the world today. The Committee reviewed eight country reports during this session, decided two individual cases, issued a special statement concerning the conflict in Gaza and its impact on women and children civilians, held a special half-day discussion on the right to education, and continued work on several draft comments and statements. The Committee also adopted on a trial basis, a simplified reporting procedure similar to the procedure which is now being offered by several of the other human rights treaty committees. Under this procedure States have the option to select this new procedure instead of the traditional reporting procedure, and if they do, the Committee will issue a list of issues before the report is prepared that will then form the basis of the state party’s report. Instead of doing an item by item analysis to the treaty’s articles, this procedure will permit the state party to instead structure their report as a response to the questions and issues posed by the Committee instead. Each report was reviewed by the Committee and discussed with the government delegation. The Committee issued Concluding Observations on each report, from 10 to 15 pages in length, containing positive aspects and areas of concern. Counting sub-items, there were between 49 and 82 recommendations for each report. In each case several items were identified for follow-up by the government in either one or two years, depending on the country. The next full report for each country is due in 4 years, July 2018. Two individual decisions were decided by the Committee during this 58th session. One case involving Spain found that the government had committed human rights violations. The other case, involving the Philippines, concluded that the complaint did not sufficiently substantiate a claim and was therefore inadmissible. Here is a brief summary of each case. I will post a more detailed analysis of each decision in at a later time. Gonzalez Carreno v. Spain, CEDAW/C/58/D/47/2012 (July 18, 2014), decided 17 February 2014. Represented by counsel (Women’s Link Worldwide). Gender stereotypes; appropriate measures to eliminate discrimination in all matters relating to marriage and family relations. VIOLATION. Articles 2(a)-(f); 5(a), and 16(1)(d), read in conjunction with article 1. The topic of geographic balance is addressed annually in a GA report on treaty body composition. In its 2013 report the GA report indicated that the CEDAW was underrepresented geographically by the African Group and overrepresented by WEOG. On gender balance CEDAW has been consistently overbalanced with more women than men. Currently only 1 member is male. This is not considered a healthy balance between male and female members. All of the other committees have a better balance between men and women. * It is noted that the consideration of Solomon Islands in the absence of a report had originally been scheduled for the 54th session. However, Solomon Islands submitted its combined initial to third periodic reports on 30 January 2013, and the consideration was subsequently postponed to the 59th session to allow for the translation of the report as well as the establishment of an updated list of issues at the pre-sessional working group.